China produced the most gold in the world in 2012 making it the largest producer for the sixth straight year, latest industry association data has shown. China’s gold output increased 11.66 per cent from a year earlier to hit a record high of 403.05 tonnes in 2012, the China Gold Association said on Wednesday. The output was almost 100 times that of 1949, when the country produced just 4.07 tonnes, the association said. It attributed the increase to favourable government polices, which have put the industry on a fast track and made it a pillar industry in many of the country’s gold producing areas. The country’s top 10 gold producers, including provinces of Shandong, Henan, Jiangxi, accounted for 82.71 per cent of the total national output last year. China surpassed South Africa to become the largest gold producer in 2007. And overtook India as the world’s top consumer of gold in the first quarter of 2012 according to the World Gold Council, cementing expectations that China would be the dominant buying force in the gold market in 2012. 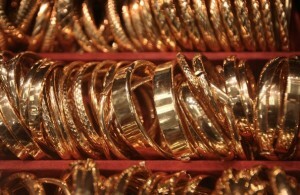 The two countries accounted for 54 per cent of global gold demand in the first quarter of 2012.